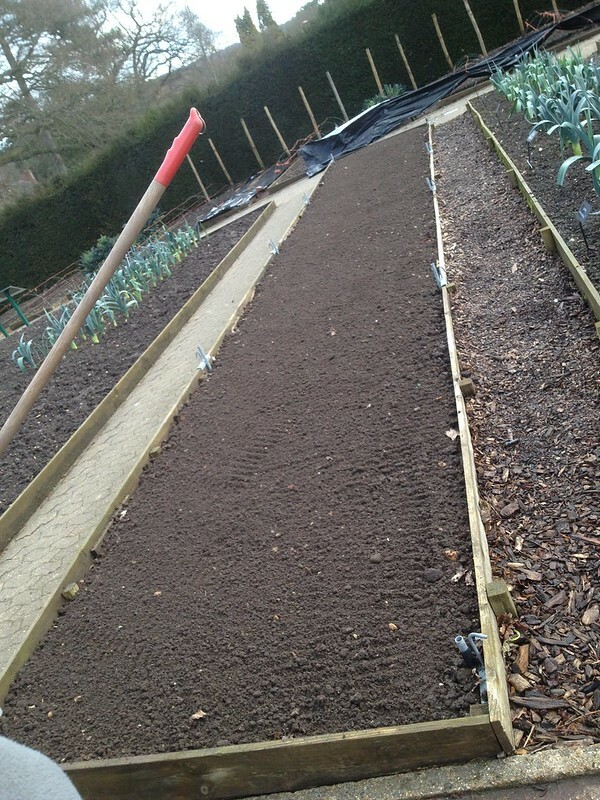 Sowing sowing everywhere, than thinning out, planting out, covering, watering... nobody is to be left behind, in the rush to get the beds filled and looking lush! 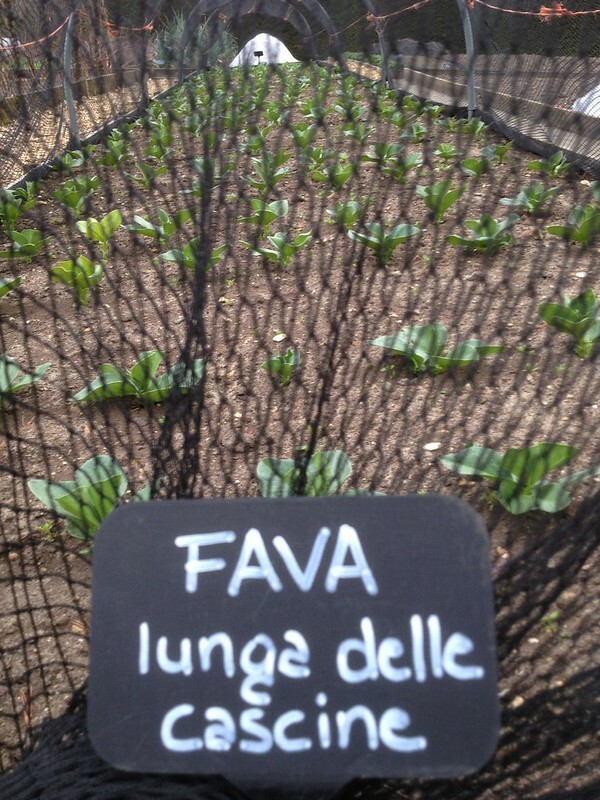 That is what I have been doing over the last two months in the veg garden particularly. 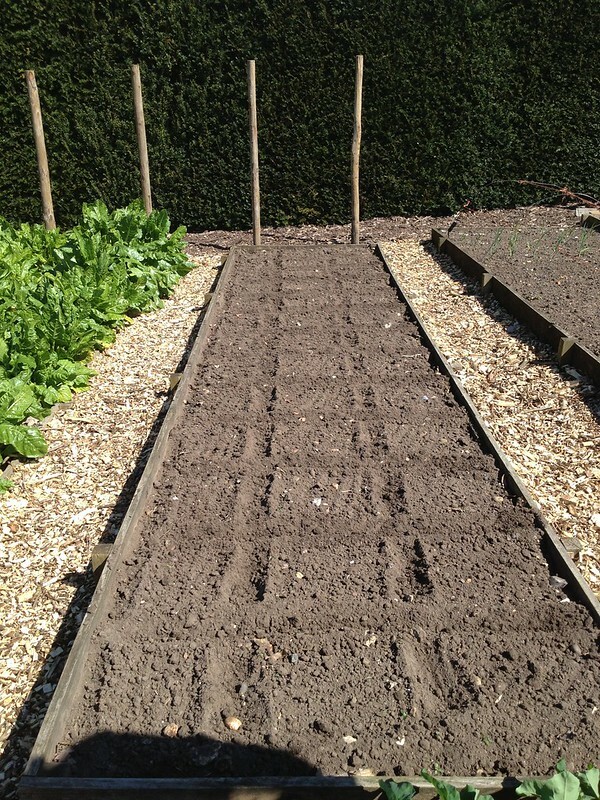 To get the perfect sowing, the beds need raking to a fine tilth. 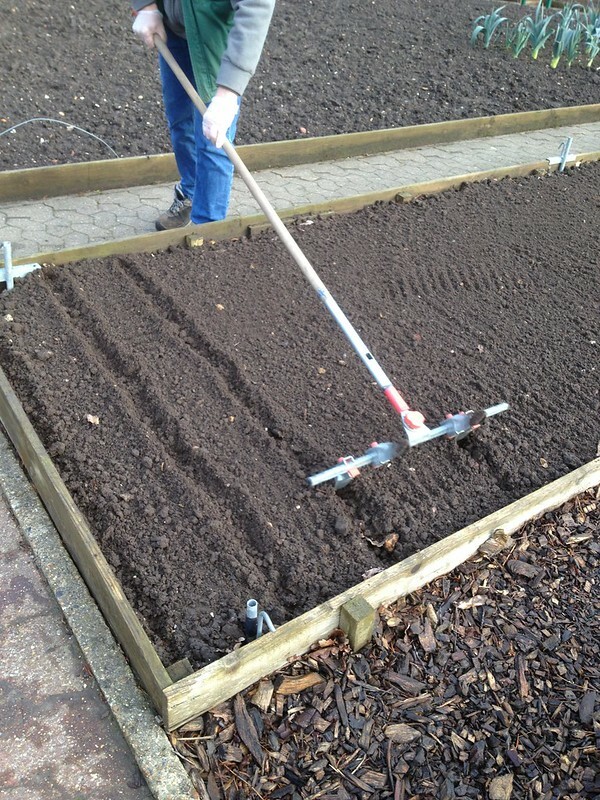 Then, with the help of a row maker, you can draw straight lines at even, well calculated distances, and of course perfect grids (for planting out). 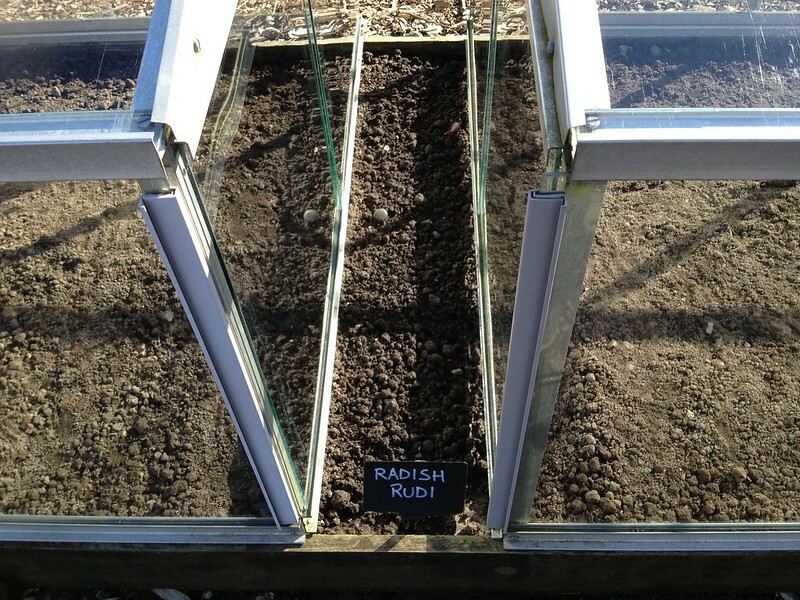 Summer radishes are sown 1-1.5 cm deep, at 1 cm spacing (thinned to 5 cm), with and 20 between rows (15 in a greenhouse); one shouldn't water seedbed until germination. In summer, if the soil is dry, water the drill before sowing the seeds to create a microclimate for them to germinate but not the surrounding soils. 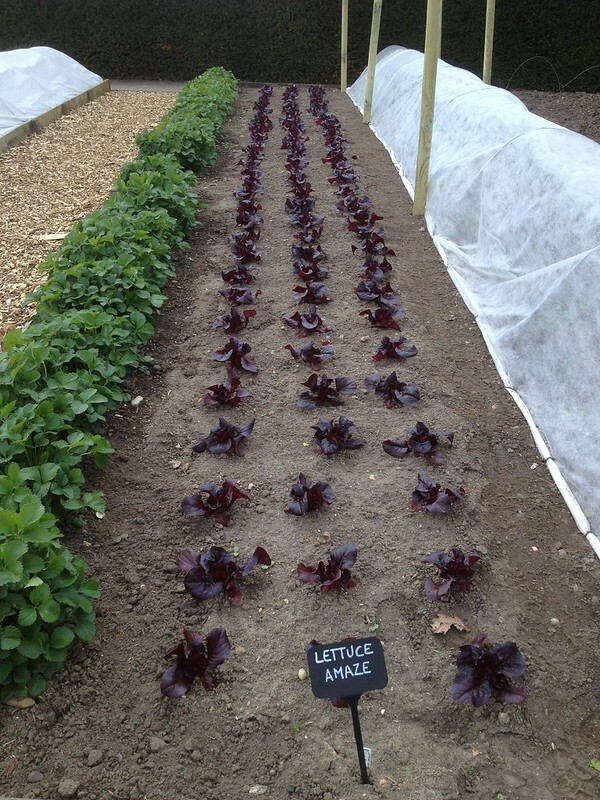 lower light levels) for examle 'Rudi', 'Scarlet Globe' and tuft leaves (ie 'French Breakfast') which are best sown towards the end of March. If you sow too late they go straight to flower same if you don't thin them out. 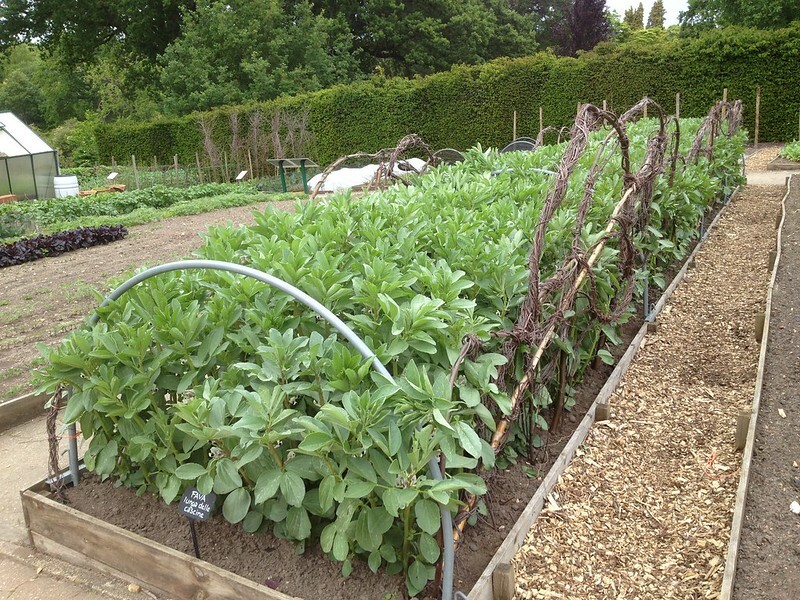 Nov, some like mooli, also know as daikon, overwinter but require wider spacing, at least 30 cm and 30 cm between rows. 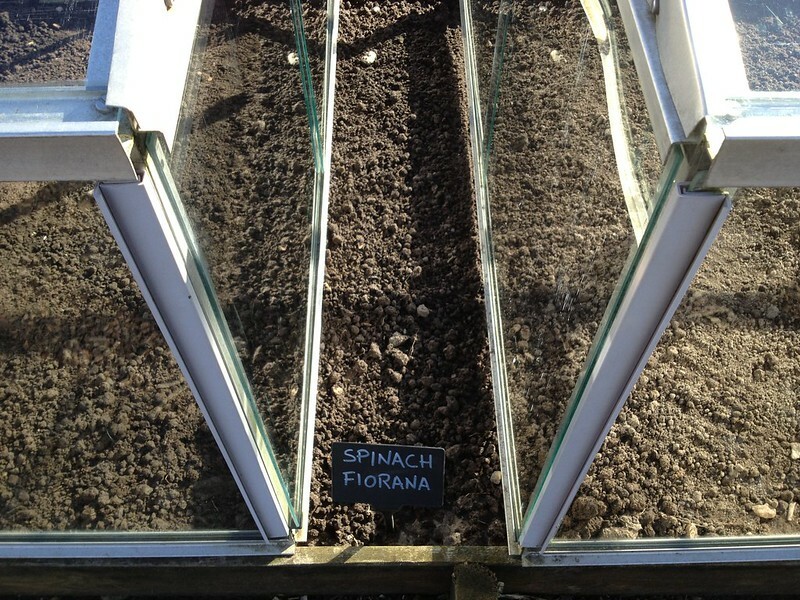 Spinach is sown at 2.5-3 cm, then thinned straight away to 5 cm. 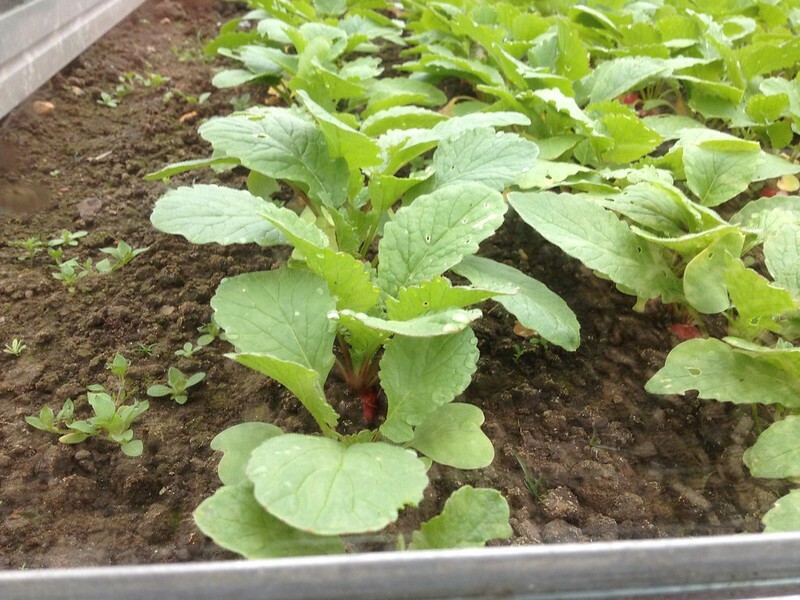 Then, depending how big you want your plants, you can harvest one in two plants as baby leaf. 30 cm between rows. 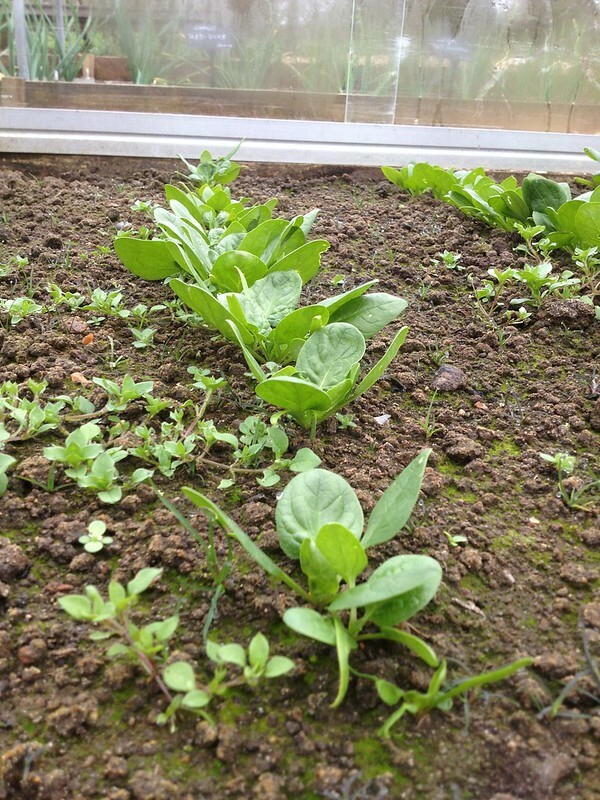 Spinach is very sensitive to day lenght, there are early sowing (flowering on longer days) and late sowing varieties (that can be sown both spring and autumn, as they are flowering on shorter days). 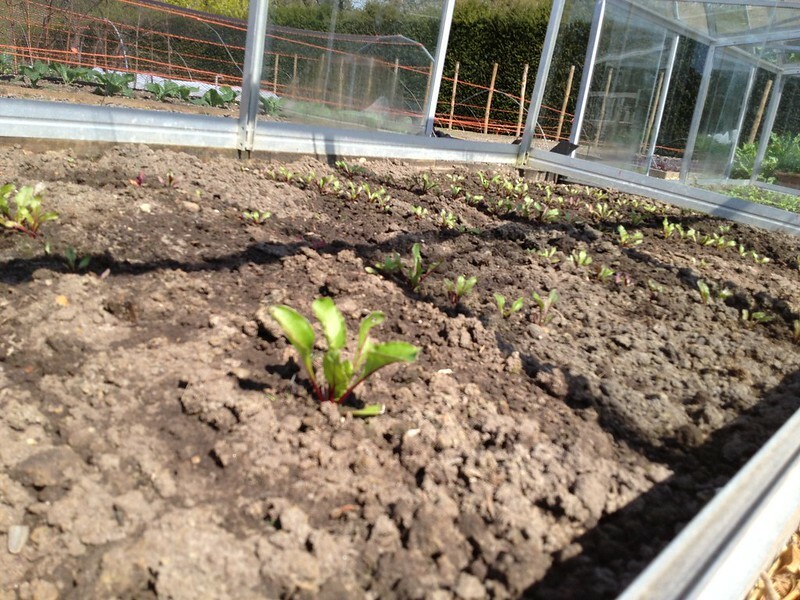 Beetroot is for April to June sowing, but a few vaieties that do not bolt if they get cold (ie 'Boltardy') so they can be sown earlier. 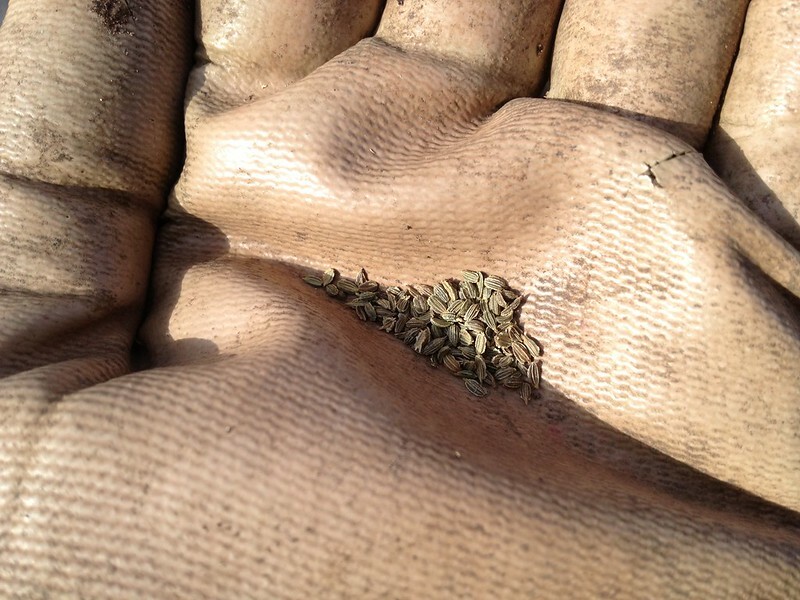 thinning of any extra seed in the cluster that germinates by snipping off. Carrot 'Marion' is very good for growing all year round even if not the perfect flavour, but aside from that variety there are early maincrop and late carrots. 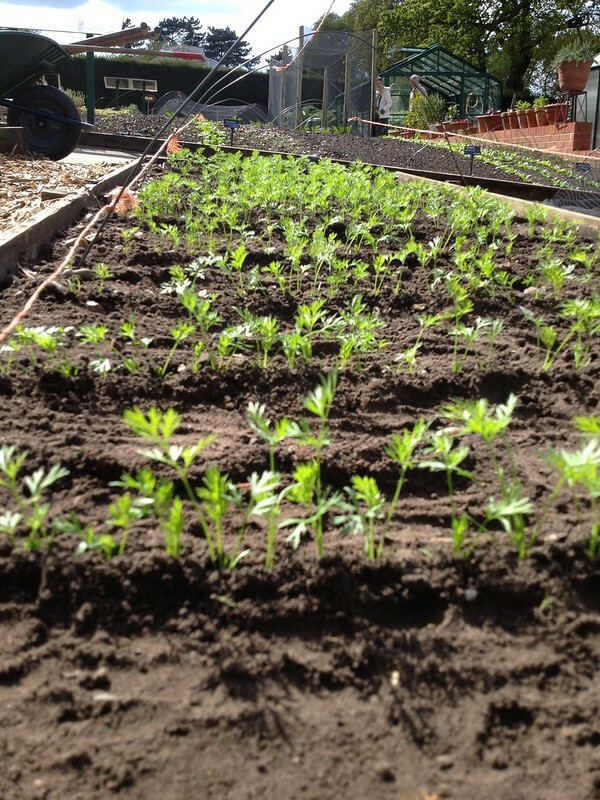 Carrots seeds are very thin, and difficult to handle. 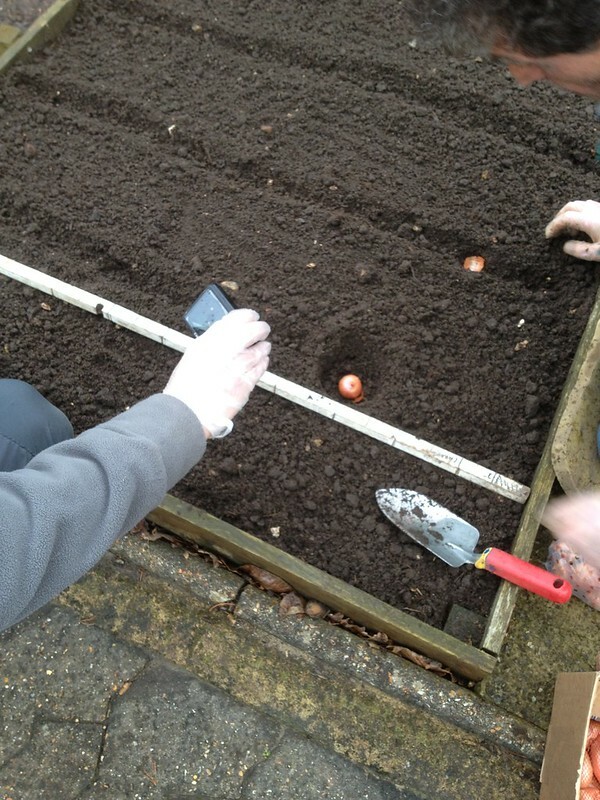 Taking only a small pinch at the time helps sowing at the right distance, which is 1 cm by 30 cm. 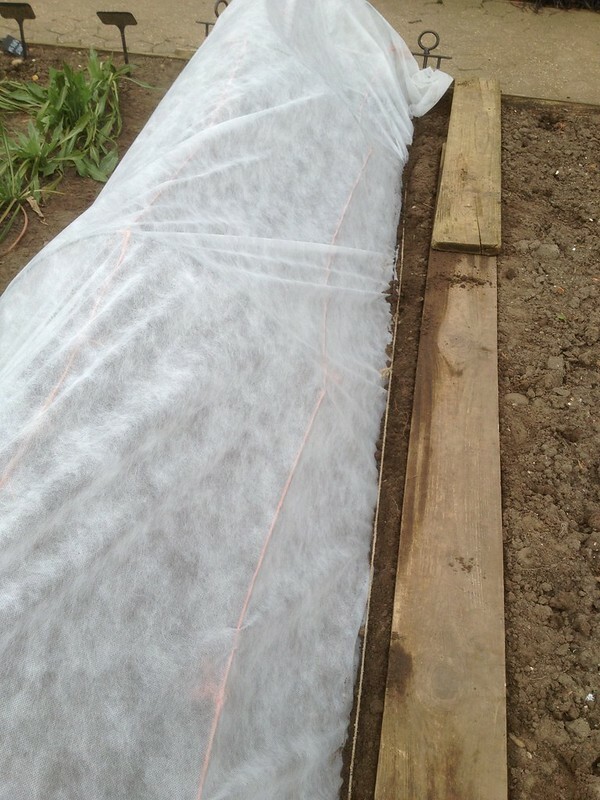 Because of the risk of carrot fly (Psila rosae) attack, carrots are covered at sowing, only uncovered once for thinning out, then covered again until picking. Because of that, you will get one crop all together; however, since the carrot fly is not around in autumn, overwintering carrot can be picked as needed. N.B. A good rule for sowing different crops next to each other: the space between them should be calculated as space of crop 1 + space of crop 2 divided by 2! I have never practised thinning out before, so this was new learning for me. 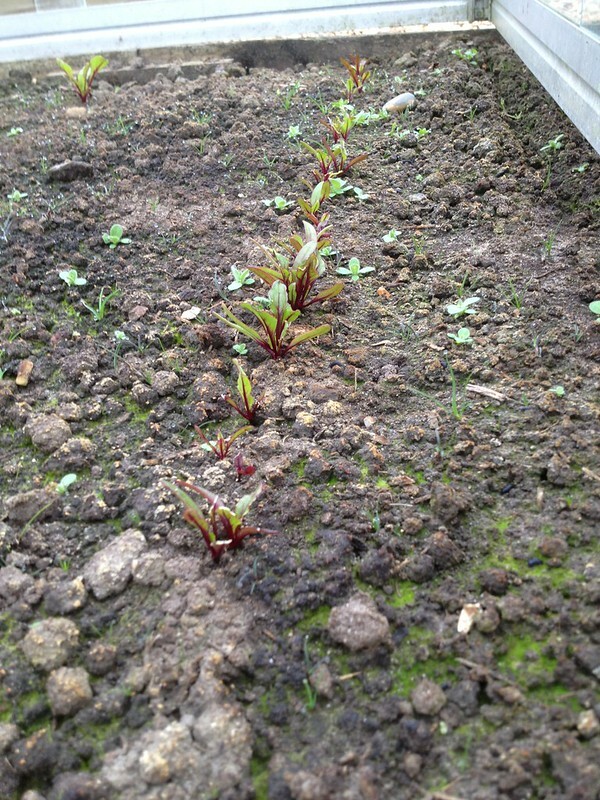 You have to choose the strongest seedlings that are about the distance you require, and pull out the remaining ones. 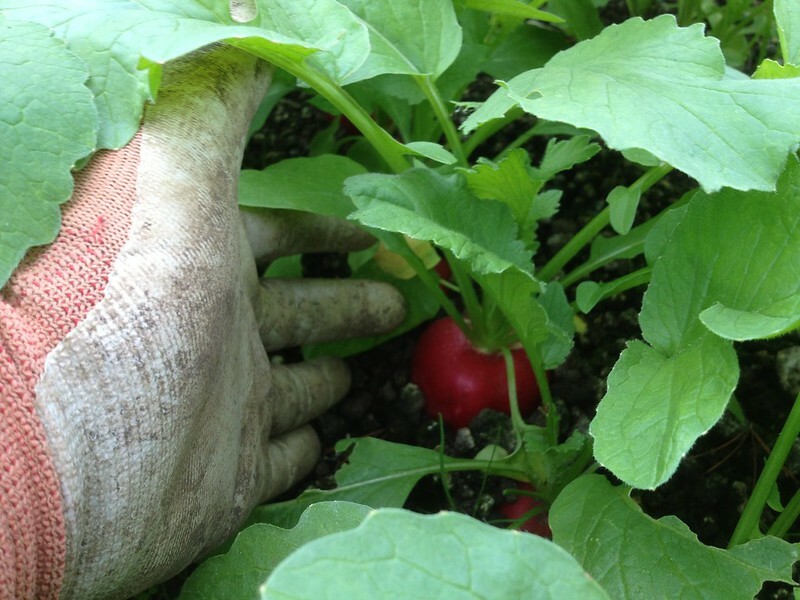 If you do thin when the seedlings have a well developed root system already (because you are too late) or when you have seeds in cluster (like with beetroot) you have to snip the competitors off rather than pulling them out, so as not to disturb the roots of the ones you want to keep. 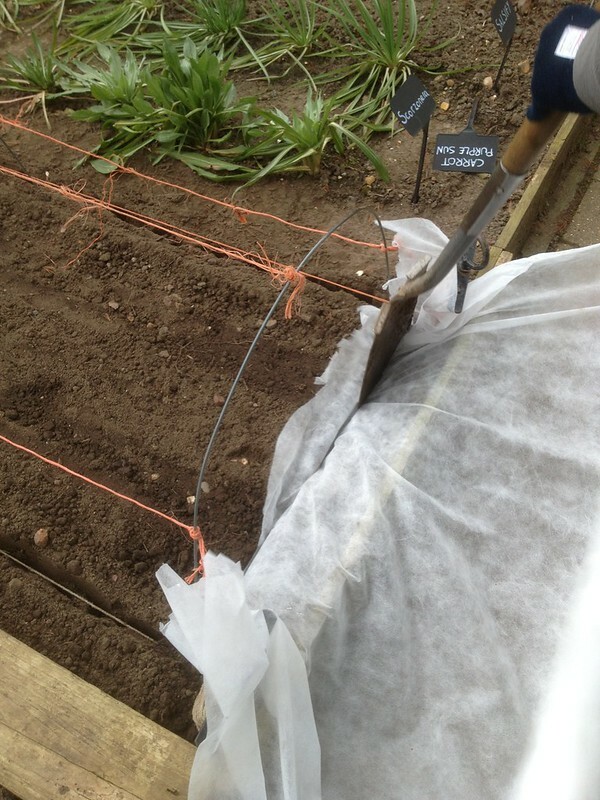 Once you have done your thinning, it is best practice to firm the seedlings in in the row, by earthing them up slightly from the sides. Then water them well. 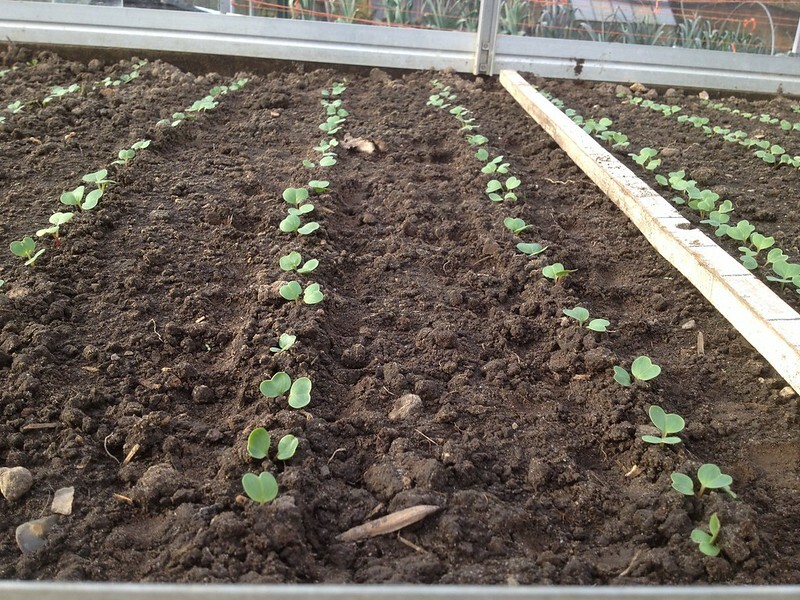 Several crops are grown in the propagation facilities and then planted out. 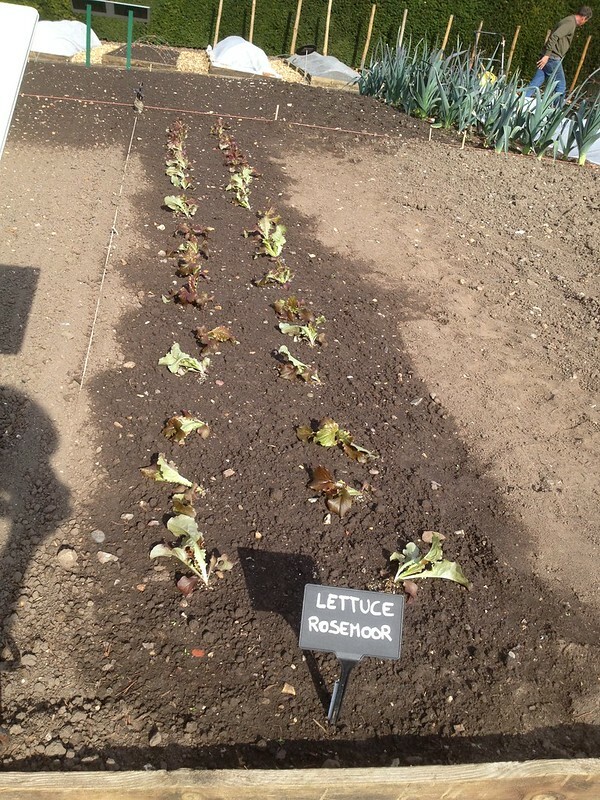 All the brassicas and the lettuces for example. 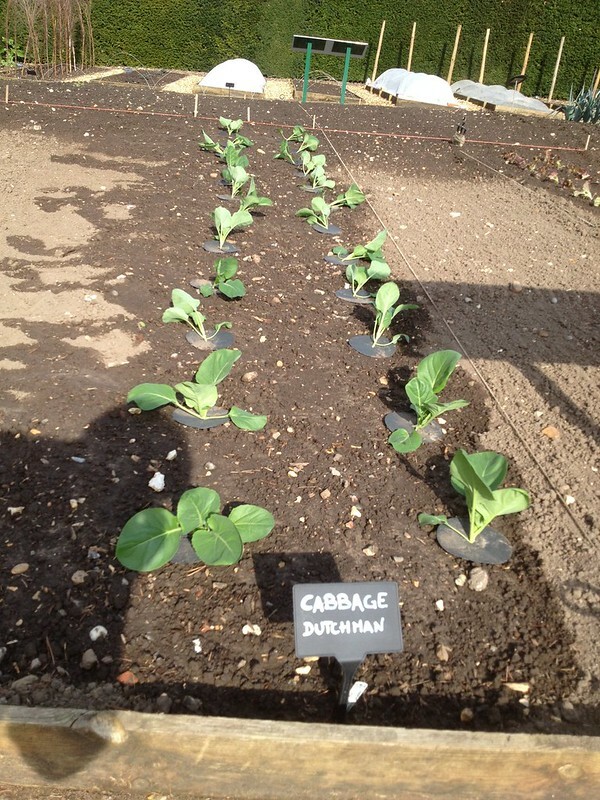 One of the most interesting things I learnt while hear is that some crops like to be planted at the same level they were in the pot, even if they flop when planted (for example brassicas and lettuces). 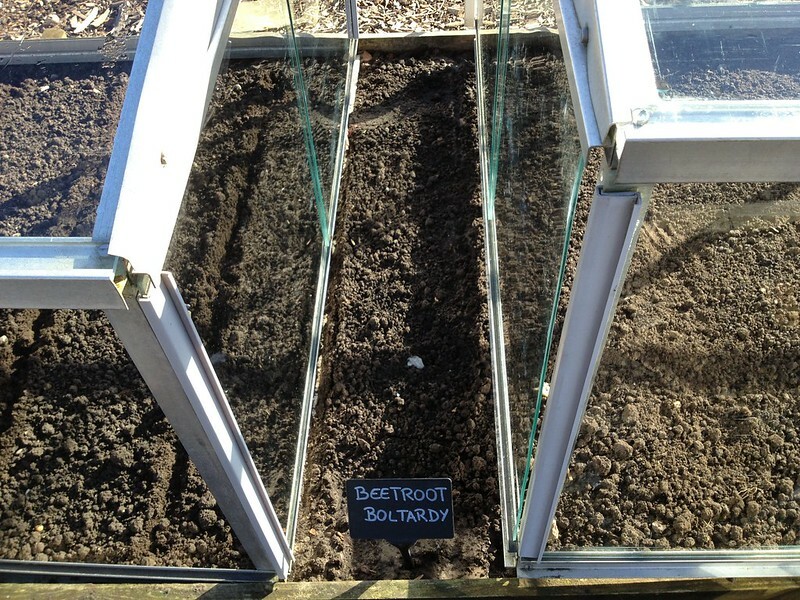 Others need firming, for example celery, which is also planted close together to provide a minimum blanching effect, even though modern varieties are self-blanching and do not need to be earthed up or otherwise be covered. 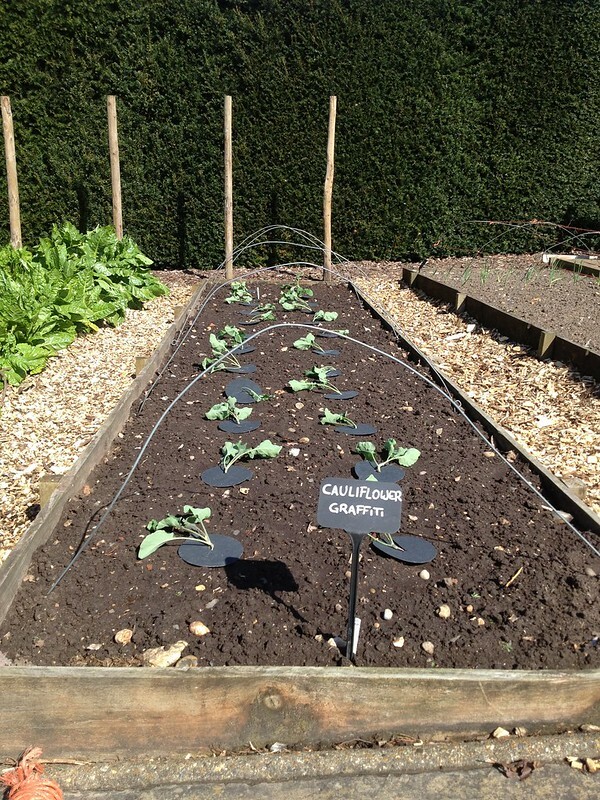 Brassicas like firm soil around them, and the taller the brassica, the firmer the soil needs to be. 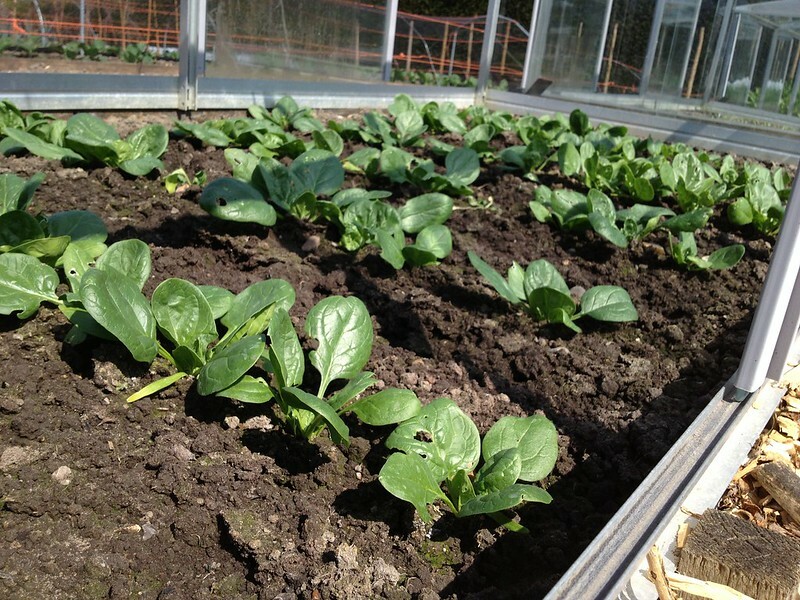 Brassicas need cabbage collars to keep the cabbage root fly (Delia radicum) at bay (if kept soil free, they form a dry environment that dessicates any eggs laid on them, while in the process helping to slow down slugs). 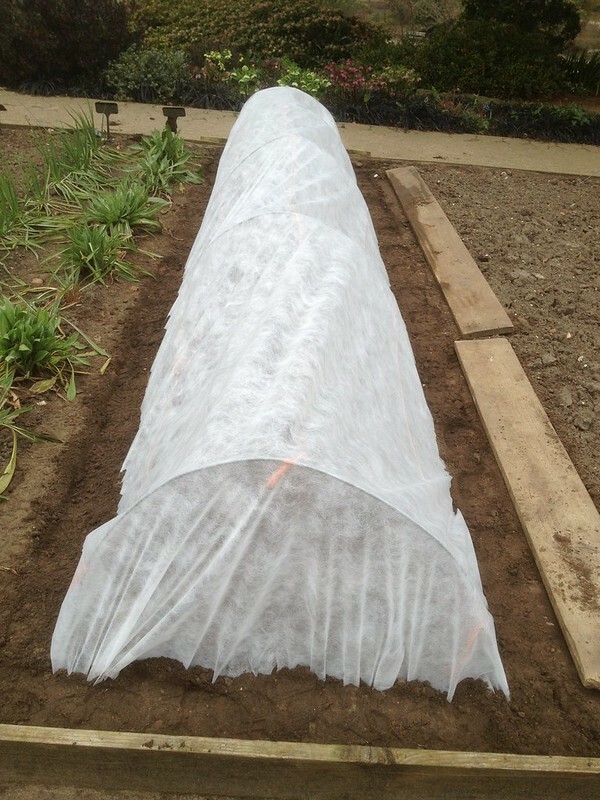 Covering is also required from the cabbage white caterpillar (Pieris spp). 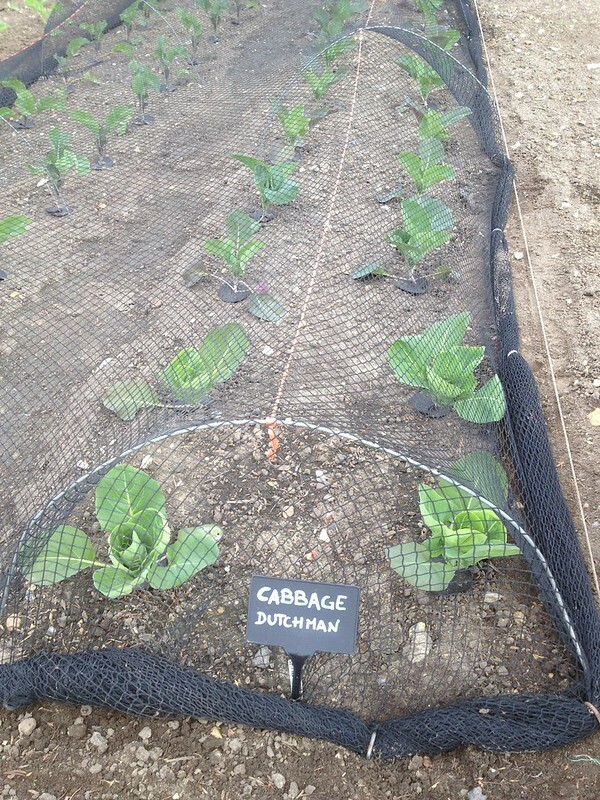 But brassicas requires a lot of light and netting shades them. 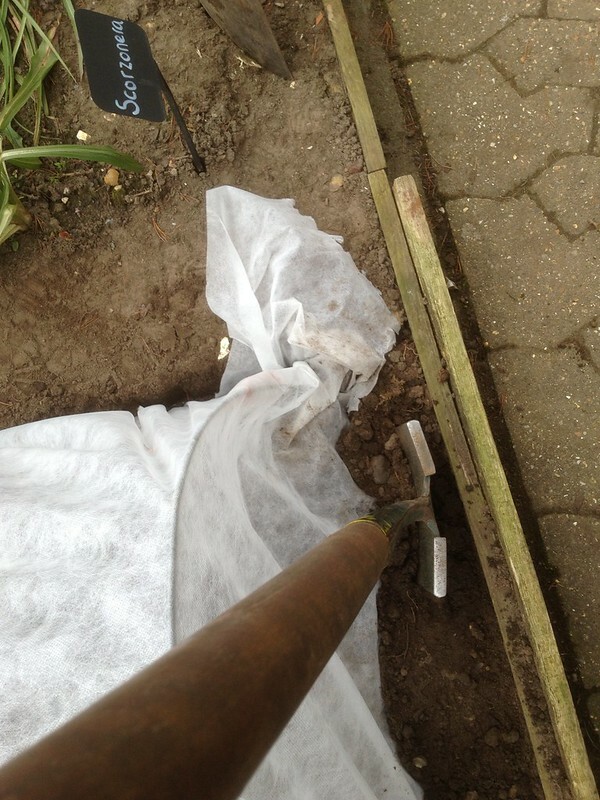 So we use netting with large holes, pulled taut so the butterflies cannot squeeze in! 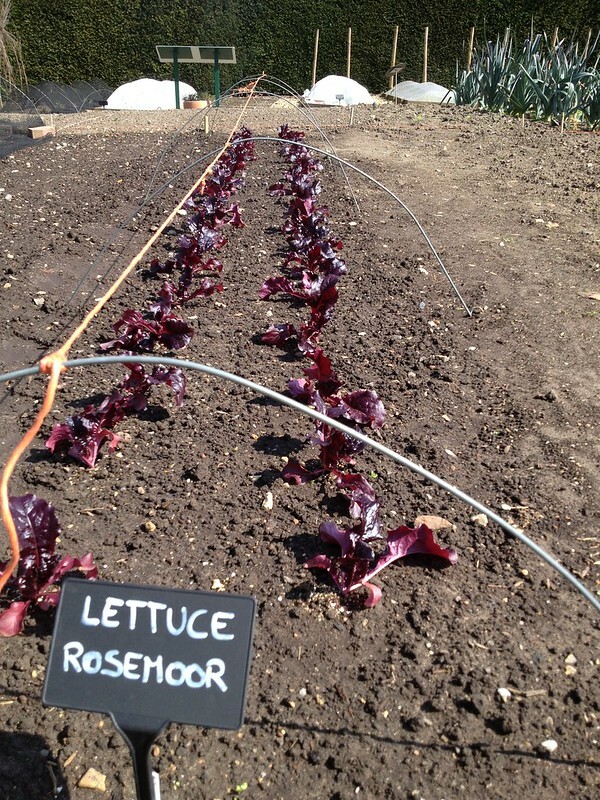 I did plant quite a lot of lettuce, so I now feel rather confident. It is generally grown in jiffy's here, so- when they are about 10 cm tall, you need to water them well to start with, peel off the ridge of the pot, then plan them at soil level having well loosened the soil for example with a bulb planter, then firm gently. Finish with watering.